Retention Recommendation: The Fourteenth Judicial District Commission on Judicial Performance unanimously recommends that Judge Shelley A. Hill BE RETAINED. Background: Judge Hill received her undergraduate degree from The College of William and Mary in 1973 and her Juris Doctorate from Vermont Law School in 1981. Judge Hill was admitted to the Vermont Bar in 1982 and to the Colorado Bar in 1999. 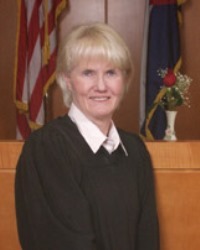 Prior to her appointment as District Court Judge in 2006, she served as Deputy State’s Attorney and as elected State’s Attorney in Vermont for a total of ten years, Bar Counsel for the Supreme Court of Vermont for six years, and in private practice for two years with a focus on general litigation. After moving to Steamboat Springs in 1998, she served four years as a Magistrate for the Fourteenth Judicial District prior to entering again private practice in Steamboat Springs. She also serves on the Ethics Committee of the Colorado Bar Association and will be the Chair of the Committee for one year commencing in September, 2014. Judge Hill currently hears all District Court cases, which include civil, domestic relations, juvenile, probate, and criminal matters. Evaluation Methods: The Commission reviewed written evaluations of Judge Hill from attorneys and non-attorneys, including verbatim comments attached to the evaluation questionnaires. The Commission also considered a self-evaluation, orders and opinions written by Judge Hill. Finally, members of the Commission personally observed Judge Hill in her courtroom and conducted a face to face interview of her. Of all attorneys surveyed about retention, 89% recommended retention, 4% not to retain, and 7% made no recommendation regarding retention. Of all non-attorneys surveyed, 88% recommended retention, 6% not to retain, and 6% made no recommendation regarding retention. (These percentages may not add up to 100% due to rounding.) All of the groups surveyed had a sufficient response rate. Performance: Judge Hill performed well in all criteria in which she was evaluated, including case management, application and knowledge of law, communications, judicial demeanor, and diligence. Attorneys and non-attorneys alike commented positively on Judge Hill’s demeanor, noting that she is fair, neutral, and well-reasoned in her orders. She treats participants with respect and is pleasant. She is prompt, maintains good control of her courtroom and evenly applies the standards she has set. She also takes the effort to courteously explain the court process to witnesses, jurors and parties, and to ensure that all participants understand her decisions. Her application of the law is solid and she is a willing student in those areas of the law where she may not have had prior experience.